Some Beyma components of my cabinet do not work. What should I do? Please contact your authorized distributor immediately. If you need to purchase replacement parts or repair an OEM product, contact the manufacturer directly. Acustica Beyma cannot supply information of its components used in OEM manufacturers. Can I repair my Beyma components by myself? In case of coaxials you can find the diaphragm references (high and low frequency) in the technical data of each product. Can I buy Beyma speakers directly? I am interested in an OEM project, How to contact? How we define power capability in our products? The speaker is mounted in free air (without enclosure). In case of compression drivers, the recommended horn is used. A continuous pink noise signal is applied, filtered (f – 10 • f) with a 12dB/Oct slope and a crest factor of 6dB. This test will be 2 hours. The power indicated in the catalog ensures that the loudspeaker will not suffer any irreversible change in its properties. In the case of RMS power, we will follow the expression WAES = V2 / Znom, where Znom is the nominal impedance 8 Ω, 16 Ω, 4 Ω. How does Beyma calculate the Xmáx? 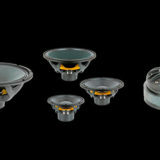 The Xmax is calculated as (Lvc – Hag)/2 + (Hag/3,5), where Lvc is the voice coil length and Hag is the air gap height. This value indicates, as a guideline, the linear excursion capability of a speaker. What are power compression losses? The value of the electrical resistance of a loudspeaker (Re) depends directly on the temperature. Due to continued use of the loudspeaker, the value of Re increases drastically after a period of time. This leads to a decrease in the speakers efficiency (less SPL than at the beginning). 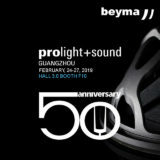 To minimize this effect Beyma, throughout its history, has developed different technologies to cool the voice coil. What is the EBP (Efficiency Band Pass)? In the design of cabinets, this value is used as a starting point to determine the type of enclosure to be used. For example, a typical EBP for Bass Reflex box is usually around 100, and for sealed box, around 50. Sensitivity is a parameter defined from the receiver’s point of view. Indicates the average value of the sound pressure level in the frequency range of the speaker at a certain distance (1m) with a fixed electrical power (1W), expressed in decibels (dB). Efficiency is a parameter designed to characterize the ratio between input and output energy in a transducer. This is the relationship between electric watts delivered to the source and acoustics watts produced by the source. Both magnitudes are closely related. Generally, a high sensitivity speaker will have a higher efficiency value. Does Beyma offer design services for custom cabinets and passive filters?